them in Georgia, Missippi, and Tennessee. In 2011, she did one in Apex, North Carolina. It was a beautiful drive up and we found restaurants along the way that served up great food. We often judge the quality of trips by the food we find. Mediocre food figures poorly into the bottom line score of any destination. One added benefit of Apex was that it had an Orvis store. 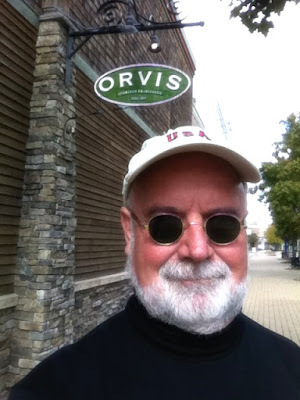 If you're not familiar with Orvis, it's a store that caters to outdoors activities. Hunting, fishing, and other stuff. I don't hunt, but I love fly fishing. My flyrod has an Orvis reel on it. Several of the flies in my pouch I purchased at Orvis. So, while I love my friends in Georgia, Tennessee, and Missippi, I really want to spend a few days in Apex. My father made his flies. And lost them regularly. Good luck on the lobbying effort. That is a nice area of NC. My Cochlear implants were done in Durham, not far from Apex. I gotta force myself to do some yoga! Seems the only way we can do it is in a group. Ive never heard of orvis. We have a bass pro shop . I agree that good restaurant food and good service makes a trip enjoyable but if you experience mediocre food and poor service it takes the fun out. My brother in law makes his own flies and also sells them to fishing shops to make extra money. As long as you have to make the trip, good food is a bonus for sure. Hope you get your wish. I hope the westher is right for fishing. Jilda will be busy meditating. Road trip! Enjoy and I know Jack would love the Orvis destination too! I hope it works out for you and you get to go to Apex.